Why has tendu leaf revenue not reached forest dwellers even after 50 years? India's biggest tendu leaf producing state is witnessing a kind of upheaval. On June 26, when anti-corruption ombudsman of the state, the Madhya Pradesh Lokayukta, registered a case against the State Minor Forest Produce (MFP) Co-operative Federation Ltd, responsible for trading and developing MFPs in the state, it puzzled many. At the same time, it has reignited an age-old debate: why should the government not withdraw from the trade of tendu leaves and hand it over to forest dwellers? After all, the leaves, primarily used to wrap beedis, provide the largest seasonal income and employment to the 7.5 million forest-dwelling people in 12 states. Going by the case filed by the Madhya Pradesh Lokayukta, the state’s MFP federation stashed away some Rs 365 crore in its coffers for over 16 years till 2014. The money is just 30 per cent of what it had earned during the period by selling MFPs like tendu leaves, sal seeds and kullu gum, with tendu generating 99 per cent of the revenue. The MFP federation should have spent the money on development projects for forest-dwelling communities who collect the produce. But it did not. The irregularity came to light in April when Irfan Jafri, an activist associated with Bhopal-based non-profit, Kisan Jagriti Sangathan, blew the whistle. Jafri says the amount would cross Rs 500 crore, if one considers the revenue earned by the state’s MFP federation in the past three years. Experts say such irregularities have become the norm since the nationalisation of tendu leaves. “This is unfortunate,” says Manas Ranjan Mishra of Vasundhara, a non-profit that works on sustainable livelihood in Odisha. In the 1960s, when the state governments realised the commercial value of tendu leaves and began nationalising its trade, their objective was to protect the pluckers from exploitation by beedi manufacturers and tendu leaf buyers. In fact, the government enacted laws—The Panchayats (Extension to Scheduled Areas) Act, 1996 (PESA) and the Forest Rights Act, 2006—to protect the rights of forest-dwelling communities and tribal people over MFPs. But forest departments never ceded the right over MFPs like tendu. So, the pluckers cannot sell the leaf to anyone else, even if it means selling at a lower price, explains Mishra. The forest department then sells the leaves to commercial traders, he adds. Some states like Odisha, Chhattisgarh, Madhya Pradesh and Maharashtra have the provision to transfer 70-100 per cent of the revenue earned from tendu trade to pluckers as bonus. But they hold back a portion of the revenue, saying it would be diverted for the development of the communities through various schemes, says Sudhanshu Shekhar Deo of Regional Centre for Development Cooperation, a non-profit. “But this money rarely reaches them,” Deo adds. States like Madhya Pradesh have many such programmes for tribal social security. But in the absence of proper fund disbursement, these programmes fail to take off. In other states like Rajasthan, where the forest department auctions tendu leaf collection rights, it directly transfers the money to the district panchayats, which then distributes it among gram sabhas, says Kamendra Singh Rathore of Samrthak Samiti, a society of forest produce collectors in Rajasthan. “Under the provision, communities responsible for plucking do not get the entire benefit. Instead of rerouting their rightful dues through schemes, the government should offer a better price to the pluckers,” Rathore adds. 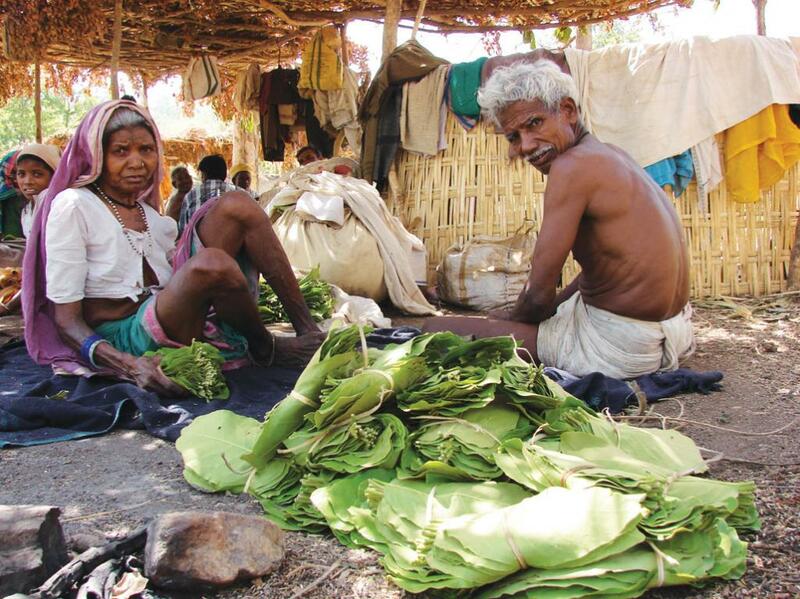 To get the rightful price, pluckers from six gram sabhas in Odisha’s Kalahandi district tried to sell tendu leaves directly to a trader in May this year. While the government rate for 60 tendu leaves is Rs 2.40, the trader offered them Rs 7.50 for the same. The Odisha forest department deemed it illegal. “We are in talks with the forest department to deregularise tendu in Kalahandi,” says District Collector Anjan Manik. On July 3, Union Tribal Minister Jual Oram wrote to Odisha Chief Minister Naveen Patnaik, asking him to intervene in the matter. In another similar case, tendu pluckers from the state’s Nabarangpur district demanded denationalisation of the produce in 2013. The government withdrew from the trade in April, just a month before tendu auction begins across the region. This left the pluckers in a lurch, who did not know how to maintain the collection centre or organise an auction. In this way, the government reasserted its right over tendu, saying that communities failed to take control of the trade. Tendu has been a buyer’s market where pluckers have little say over its price. The Tribal Co-operative Marketing Development Federation of India Ltd estimates the total market value of the commodity to be Rs 1,040 crore. “As it is a huge market, government support is needed to run things smoothly,” says Sharachchandra Lélé, senior fellow, Ashoka Trust for Research in Ecology and the Environment, Bengaluru. N C Saxena, former member secretary of the erstwhile Planning Commission, highlights the reasons tendu leaf pluckers require government support. Tendu bushes require regular pruning to augment the growth of new leaves. Collection centres have to be repaired and maintained, and auctions have to be organised. At present, all these activities are carried out by the forest department for free. So, the state’s involvement cannot be undermined in the trade. But the government should not be the sole authority responsible for its trade. It should rather fix a minimum support price for tendu, he adds. A good way to protect the interest of collectors is to give gram sabhas the choice of whether they want the government to trade tendu leaves or auction the leaves themselves, says Mishra. This is happening in some gram sabhas of Maharashtra (see ‘Turns of the tendu’). As part of solution, Mishra suggests two kinds of models to ensure pluckers are not exploited. One is the formation of pluckers’ collectives where they can organise the sale with the government’s help. The second is through associations comprising several gram sabhas. Pluckers in Kalahandi may have failed to assert their rights, but these measures will ensure they are not cheated. This story was first published in the August 16-31, 2017 issue of Down To Earth magazine under the headline "Not a minor lapse".